Then, I realized how much space they take. We don't have that kind of space in this house. I also realized I had a beautiful antique rocker sitting in the guest room that was begging to be refinished. Matt's Great Aunt passed it down to us, and we both love the idea of bringing some glory to the vintage piece. We don't have an exact idea of how old it is, but when we flipped it upside down, we found a piece of paper that had a date of 1930 scrawled onto it. 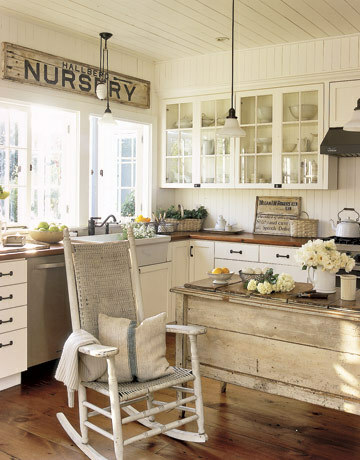 I'm not sure why that rocker is smack in the middle of a kitchen, but we'll ignore that part. Matt removed the seat one night last week and I brought it to Suzan so she could start work on that part. Tonight, we cut off the back of the rocker, so I can start painting it tomorrow! With Griff looking on, (like always) Matt used one of his new Christmas toys (a possibly illegal knife) to start cutting away the rigid cane work. In the end, the rocker was stripped bare and it's (sorta) ready to rock! I'm planning to use Annie Sloan's Chalk Paint in "Pure White" for the frame, which will go nicely with the natural cane. The neutral colors mean I can use a bold pillow, which will complement the room's bolder color accents, like the red lamps. I'll be working on that this week as well as starting in on some new curtains! I'll keep you posted - what did you guys do this weekend? Oh, and for those who are looking for a rough "to-do" list that I've associated with the nursery space, you can check out the list below. Some were done when we were rehabbing the space as a guest room and some are specific to the nursery.